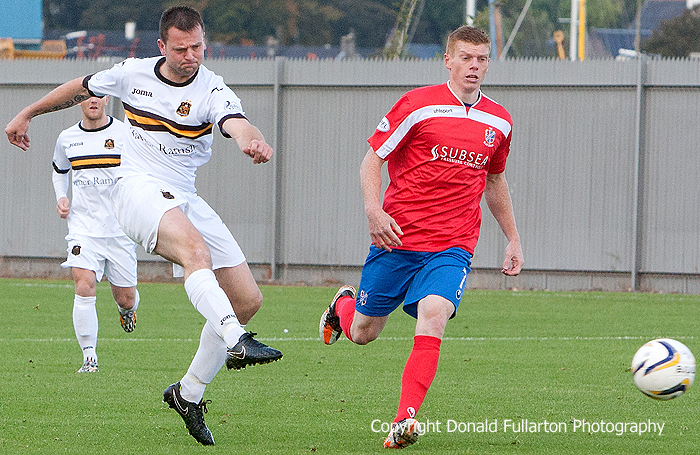 DUMBARTON and SPFL Championship bottom club Cowdenbeath fought out a competitive but goalless draw at the Bet Butler Stadium. DUMBARTON and SPFL Championship bottom club Cowdenbeath fought out a competitive but goalless draw at the Bet Butler Stadium in front of an 851 crowd. Both part-time sides played well in defence and midfield and looked promising in attack, but both were dire in front of goal. Player of the month Danny Rogers in the Dumbarton goal and Cowden keeper Robbie Thomson were rarely troubled. Garry Fleming, Jordan Kirkpatrick and Mark Gilhaney all came fairly close to putting the home side ahead, but at the other end the visitors produced a series of good moves and looked more threatening, particularly on loan striker Kudus Oyenuga — but he could not find a killer final pass and his shooting was wild. In the second half it was more of the same, with Sons coming closest through winger Archie Campbell, Kirkpatrick and sub Colin Nish. It was no surprise when a Sons defender, Scott Taggart, was named man of the match, and the draw extended Sons unbeaten run to five matches. The picture shows the ever busy Garry Fleming trying a shot.